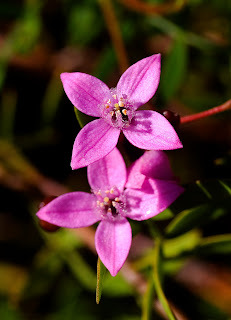 Well Greenies, wildflower season might be over for another year, but here on Fraser Island we have still got gorgeous colouration in the wallum scrub courtesy of our Swamp Banksia (Banksia robur), which bloom from spring through until April; our Lemon-scented Tea Trees (Leptospermum liversedgei); fuschia-petalled Wide Bay Boronias (Boronia rivularis - pictured left); and also from our Native Hibiscus (Hibiscus tiliaceus) – with their stunning yellow/orange/purple flowers – which can be spotted a stone’s throw from Kingfisher Bay’s famous Jetty Hut. We’ve also spotted Mangrove Lillies (Crinum pedunculatum) on our guided canoe paddles to Dundonga Creek, but haven’t as yet managed to find the elusive Myrtle Mangrove (Osbornia octodonta), which has been spotted in previous years. As the days start to lengthen and warm up, our native acid frog species will start to become more abundant and vocal in the wallum. There are 18 different species of frog on Fraser and the island is home to several species of rare acid frogs - the Cooloola Sedge Frogs (Litoria cooloolensis), Wallum Sedge Frogs (Litoria olongburensis) and Wallum Rocket Frogs (Litoria freycineti - pictured right) - which have been spotted leaping across our boardwalks during our guided walks and Junior Eco Ranger adventures. Frogs are in decline all over the world, so it is heartening to see them thriving at the moment. These 'acid frogs' are so named because they can tolerate the acidic waters of coastal wallum swamps and wet heathlands found on Fraser Island. Interestingly, the Cooloola Sedge Frog is a true native and is only found on the island and in the nearby Cooloola area south of us. DID YOU KNOW: According to the Queensland Museum’s Frog Expert, Greg Czechura, there isn’t a species of frog in the world that makes a ribbit-ribbit sound? Ribbit-ribbit, Greg says, was simply made up by Hollywood. In 2009, UNESCO (the United Nations Educational, Scientific and Cultural Organisation) announced the Fraser Coast (including Fraser Island), nearby Gympie (to the south) and the Bundaberg coastline (to the north of Hervey Bay) had been awarded Biosphere Reserve status, which put us on the same status as destinations such as The Galapagos archipelago and Uluru in the red centre of Australia. At this time of the year, the Great Sandy Biosphere as we were called – in particular the southern islands of the Great Barrier Reef including the far north west coast of Fraser; Bundaberg and the Cape York Peninsula (in the north of the state) – becomes the major breeding site for endangered marine turtles, which use a remarkable system of navigation to make their way to our shores (using the moon and the magnetic gravitational pull of the earth). 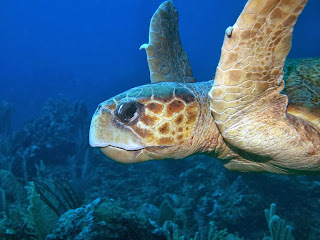 Like clockwork, various turtle species including Green Sea Turtles (Chelonia mydas), Flatback Sea Turtle(Natator depressus), Leatherback Sea Turtle (Dermochelys coriacea), the endangered Loggerhead Sea Turtle (Caretta caretta - pictured above) and the less common Hawksbill Sea Turtle (Eretmochelys imbricata) species return to the stretch of Queensland coastline where they were born and lay their clutches of eggs from November to January. From late January until the end of March, tiny hatchlings emerge and make the slow scramble across the sand – at the mercy of predators like dingoes (Canis lupus dingo) and raptors - to the relatively safety of the ocean. 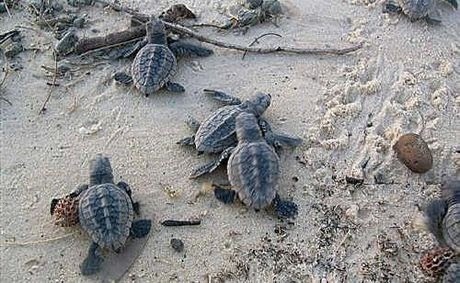 On Fraser, you won’t see hatchlings (see right) on the western beach near the resort or on the eastern side of the island. Queensland Parks and Wildlife do however enforce annual vehicle restrictions in and around the Sandy Cape turtle rookery (at the northern tip of the island) from 15 November until the end of March. Vehicles are prohibited on the beach between South Ngkala Rocks and Sandy Cape Lighthouse to protect the nesting area and help turtle populations to recover. Encouragingly, the Federal Government has also recently tripled fines for people convicted of killing, injuring or trading protected turtle species including the Green Sea Turtle and the Leatherback. Closer to home, recent neap tides and northerly winds have made for some tough fishing in the past weeks, but Flathead (from the family Platycephalidae) and Whiting (Merlangius merlangus) are still being caught in the Great Sandy Strait and conditions are set to improve over the coming weeks. Well that’s all from the Kingfisher Bay Resort Ranger team until the festive season. So long Tree Huggers!